There were no fussy buttons to spoil the clean looks of Beovision L2802. You controlled it entirely with the Beolink 1000 remote control terminal. Only a discreet red light told you that the TV was ready and awaiting your commands. The flat-square 66cm picture tube gave you a clear, undistorted view, even if you were not sitting right in front of the screen. Bang & Olufsen's own VisionClear system regulated the colour balance 50 times a second, and in variable light conditions the picture always looked good, with automatic contrast regulation and the contrast screen. As specialists in good sound, Bang & Olufsen are always very particular about loudspeakers. That is why both Beovision LX and L models incorporated a special bass-reflex speaker system, giving you genuine hi-fi quality to enhance your stereo video tapes. You could also have a NICAM decoder fitted, ready to receive stereo broadcasts of TV programmes. Beovision LX models had Bang & Olufsen's powerful Teletext module fitted as standard. However, for the Beovision L2802 and L2502 models, this was left out. This was the only difference between the LX2802 and L2802 models. 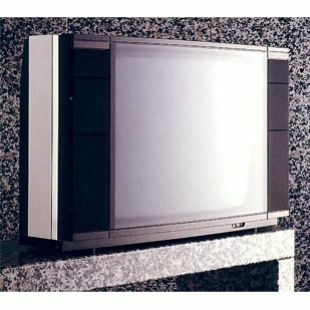 Beovision L2502 had a 63cm screen; the specifications were the same as the 66cm model.